As the best spot where everyone gathers around and enjoy lots of fun things, a living room should be designed as inviting as possible. 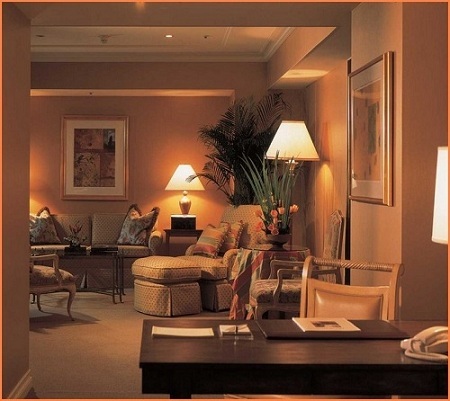 Of course, it relates to the decoration of the room which will lead you to have a certain atmosphere around. There are lots of decorating styles to give your living room a particular character. The farmhouse, shabby chic, minimalist, eclectic, and some other options are available and it depends on your taste and needs to pick one. Moreover, today some home designers suggest you have an additional or even main living room that you build outside of your home. Yeap, the outdoor living room is the thing now which will provide an extra joyful space with a very exhilarating vibe. An outdoor living room is a great place for you to have some good relaxing time, enjoy the summer breeze with your friends and family. It’s absolutely a great addition that you can keep in mind for your home improvement plan. 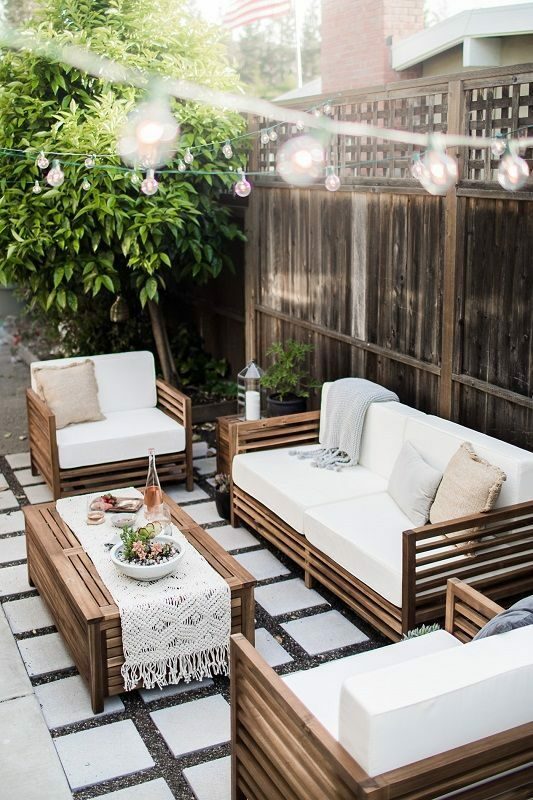 Furthermore, you can design and decorate your outdoor living room all by yourself and use some inexpensive furniture and decor items to style it up. Of course, you won’t have to spend a lot to have an admirable and comfortable outdoor living room. Here, we have picked dozens of beautiful outdoor living room ideas which will surely inspire you to have one. They are so worth to be the ultimate reference when you want to add an outdoor living room to your beloved house. 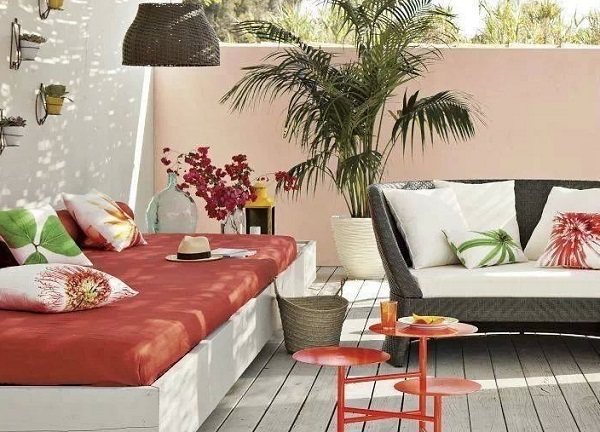 So, let’s just keep scrolling to check out our best picks of outdoor living room ideas! If you are a handy DIYer, you can build some furniture all by yourself y using cheap materials like wood shipping pallet. Here, all the sofa, chairs and table are made of the pallet which adds a unique rustic touch to its decor. The white concrete tile matches beautifully with the white cushions of the sofa and chairs. 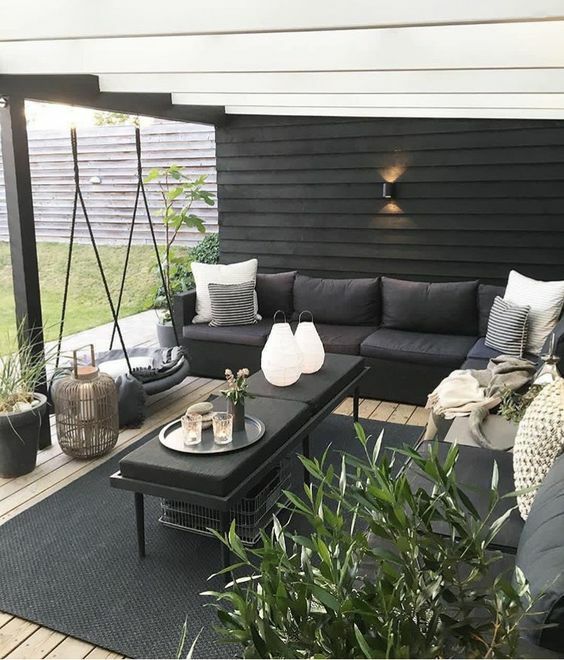 The combination of black and white as the overall look of this outdoor living room is so adorable. It has an all-black sectional which complements the black rug and ottomans elegantly. 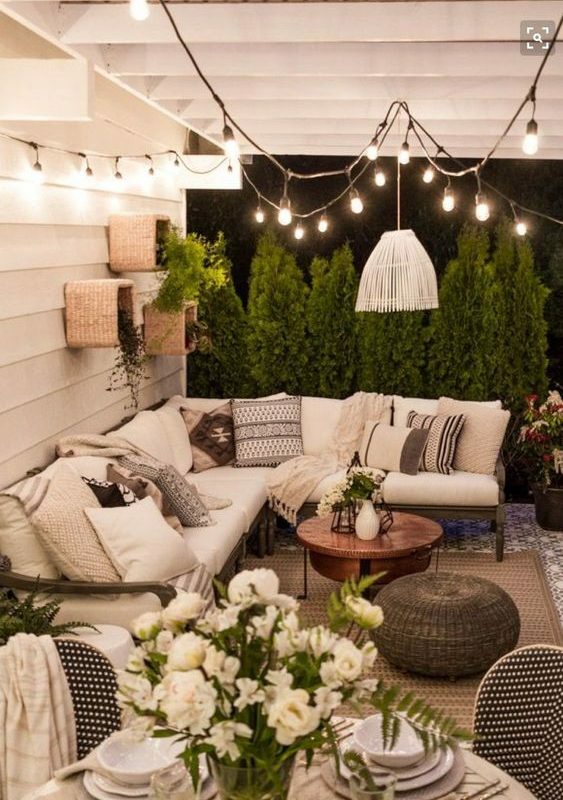 Then, its white pergola roof and decor items brighten up the nuance stylishly. 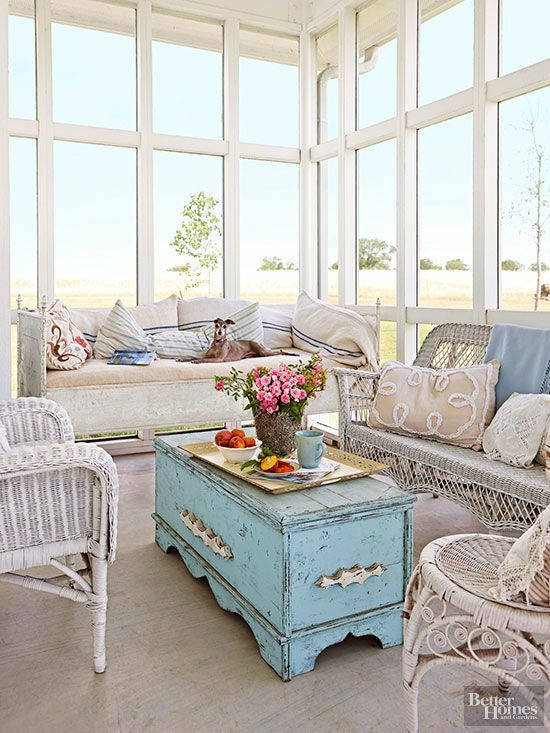 This one is a sunroom which is decorated with furniture, accessories, and decor items in various styles. The exposed brick wall gives a superb rustic touch to the decor alongside the concrete flooring. Then, the vintage white sofa and rattan chairs, contemporary ottomans, and mirrors add another style attractively. 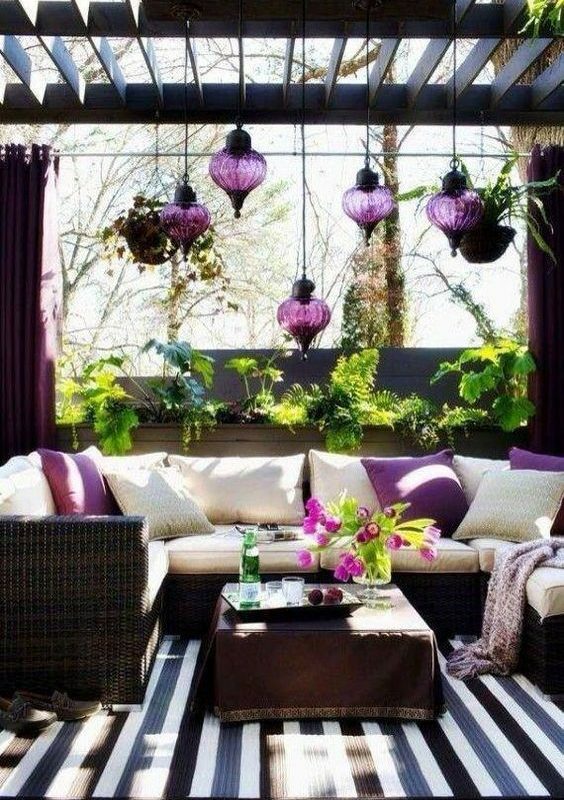 Some purple decor items and accessories make this outdoor living room look more attractive. 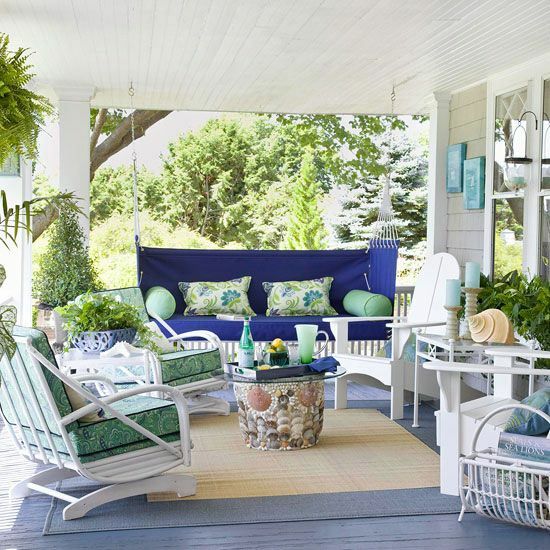 They give color to its rattan sectional with off-white cushions as the focal point. 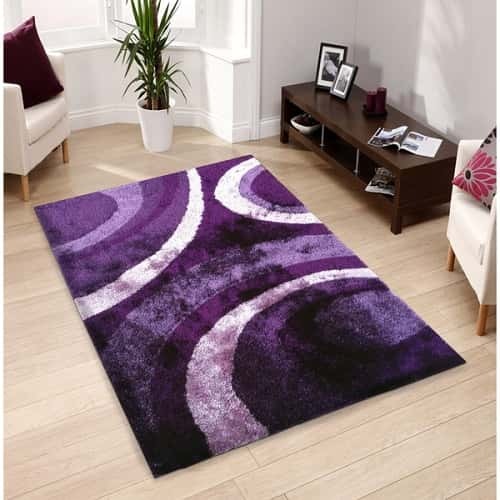 To make it look more decorative, a striped rug is made as the centerpiece of the room’s decor. 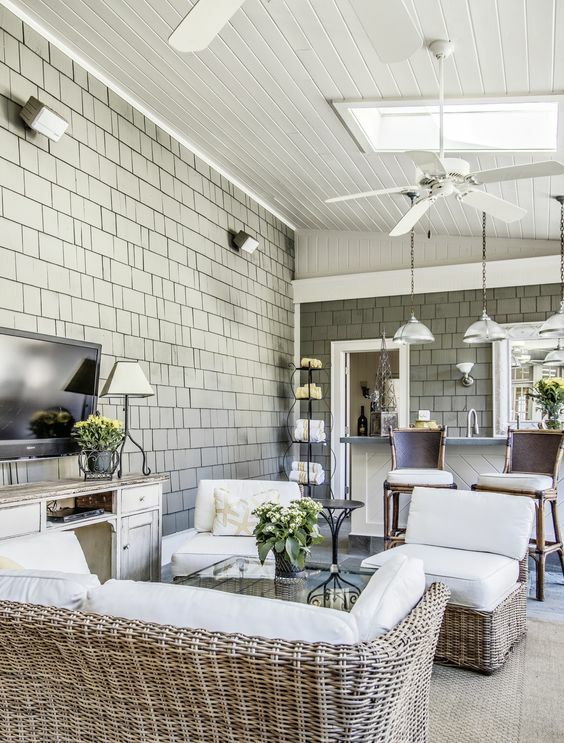 With its beadboard wall, vintage decor items, earthy furniture and greeneries, this outdoor living room is perfect for you who love farmhouse decoration. Gray and beige as the decor’s main colors give a more modern look and relaxing atmosphere which makes it so tempting copy. 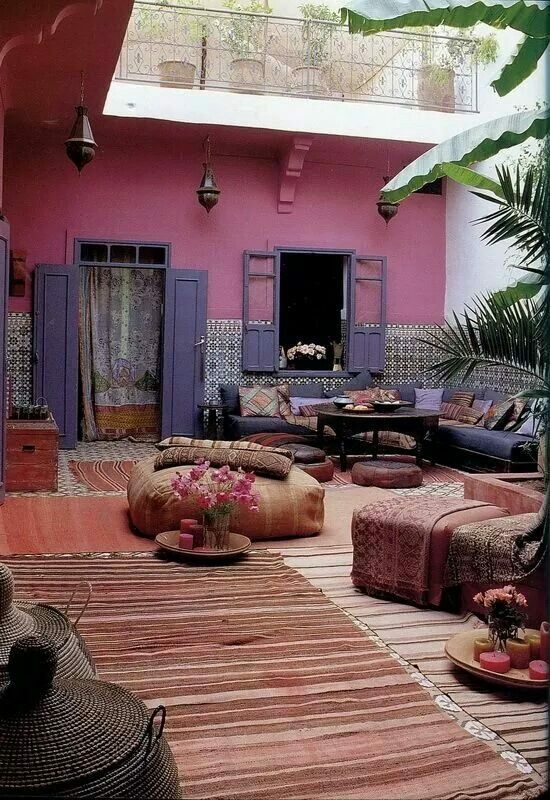 An outdoor living room with a very fun decoration which will not cost you a lot at all. 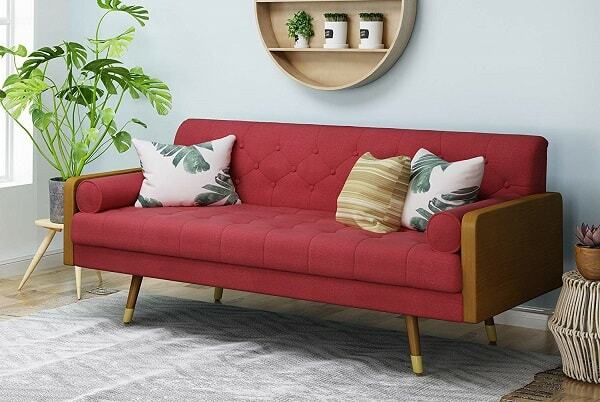 The sofa is made of shipping wood pallet, the table is made of reclaimed wood, and the attention-grabber shade is made of fabric with string light. 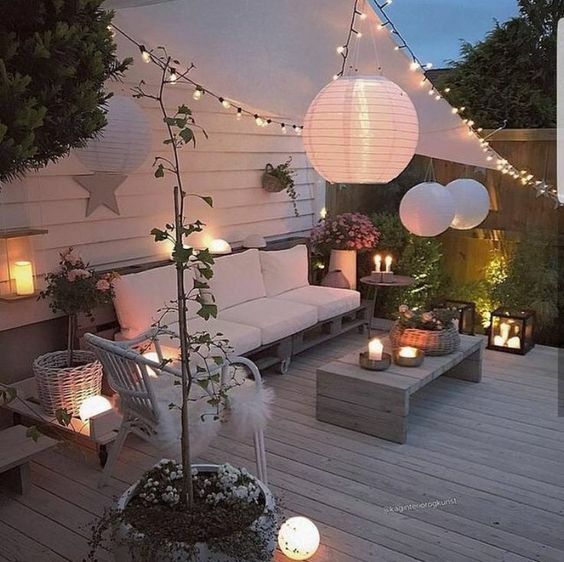 For sure, the decor looks beautiful day and night. 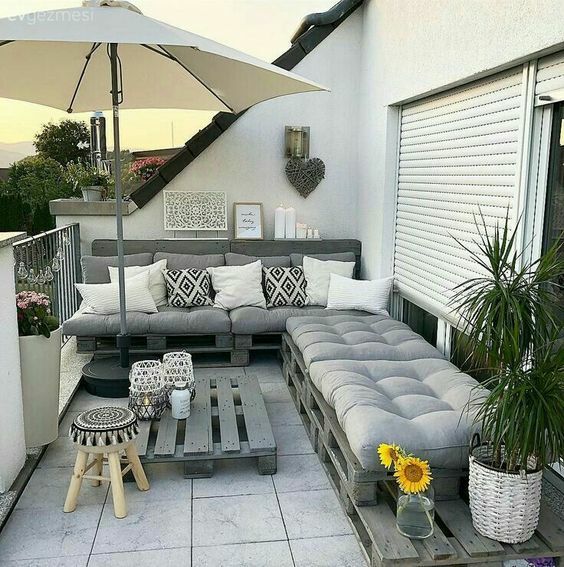 The grey pallet sectional and table are the focal point which gives a neutral touch to this outdoor living room with white flooring and walls. Some flowers and greeneries gives colorful touch and comfort the area in a natural way. It’s such a good inspiration for you who want to have an outdoor living room on a budget with minimalist decor. 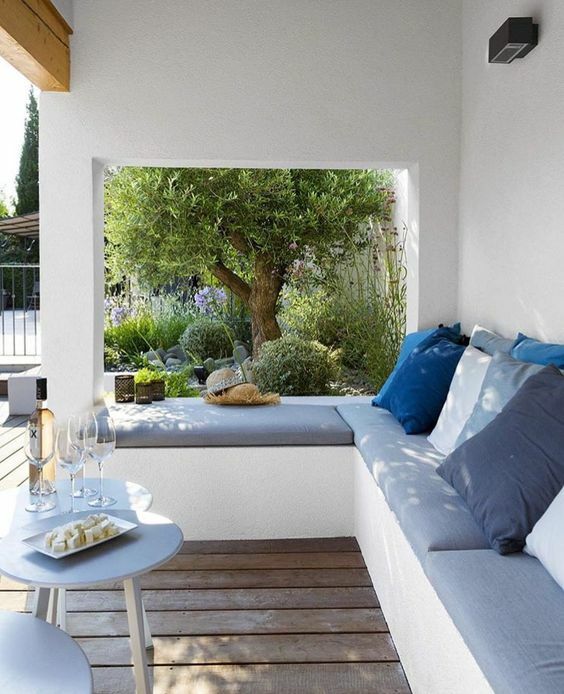 This outdoor living room has an all-white overall look which makes it look brightly inviting. Then, some string light even makes the room look much brighter during the nighttime. Moreover, it also has lots of patterns and textures which come from its decor items and accessories. The decorative throw pillows and flooring adds festive patterns while the jute rug and wool pouf give some nice textures around. An outdoor living room which is built next to the pool looks so gorgeous with its classy decoration. The ceiling with exposed wood beams in a rustic finish, rattan chairs and sofa, log-style tables, built-in fireplace, and classic wrought iron chandelier decorate the room stunningly. 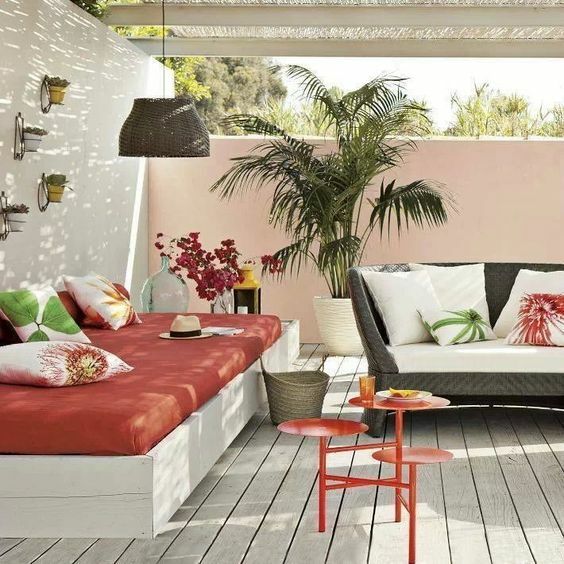 Pink and red give a chic color to this outdoor living room with an all-white overall look. The main focal point of the room is obviously its day bed which is made of the wood shipping pallet. The tiki-style roof also gives a more distinctive touch to its decoration. A simple outdoor living room for you who have a small space in your outdoor space. 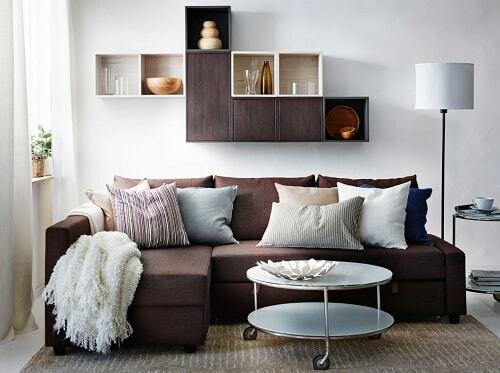 The room only has one built-in sectional which is enough to handle some guests or family members. It’s built with a very simple yet admirable construction which looks and feels so inviting. 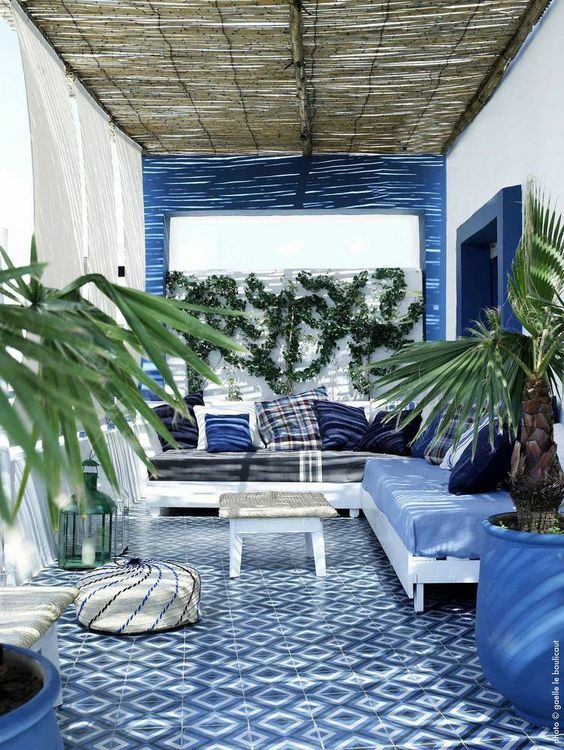 This outdoor living room has a fabulous bluish overall look due to its blue decorative flooring, sofa, decor items, and walls. 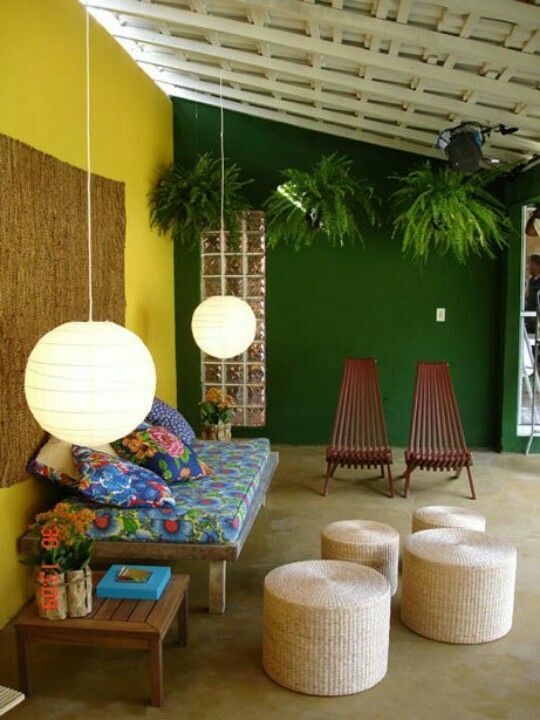 Then, lots of greeneries give another color which also creates a very refreshing atmosphere. The tiki roof enhances the earthy nuance of the decor uniquely. A beautifully distinctive outdoor living room with ethnic decoration that will bring the style of your exterior to a whole new level. 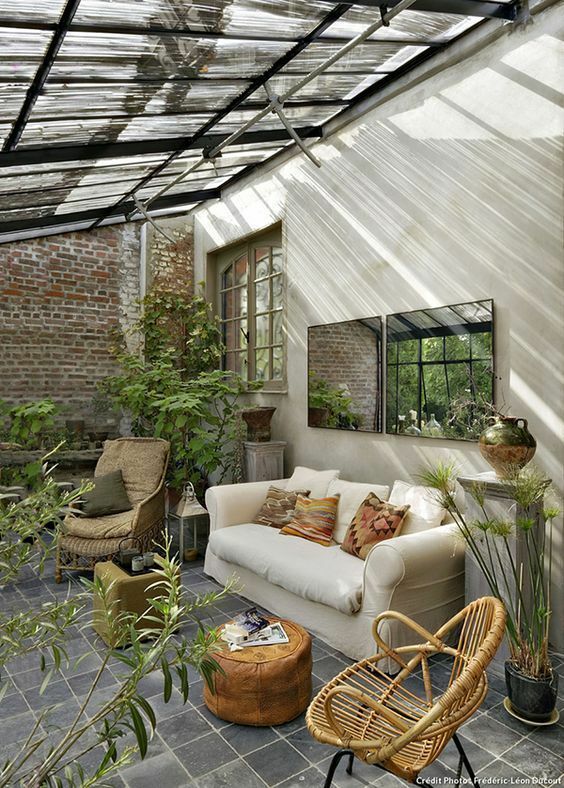 Its twig roof and various plantations give an ancient vibe which surely makes the room feel so exhilarating. The reddish color of the decor also makes it look way more attractive. 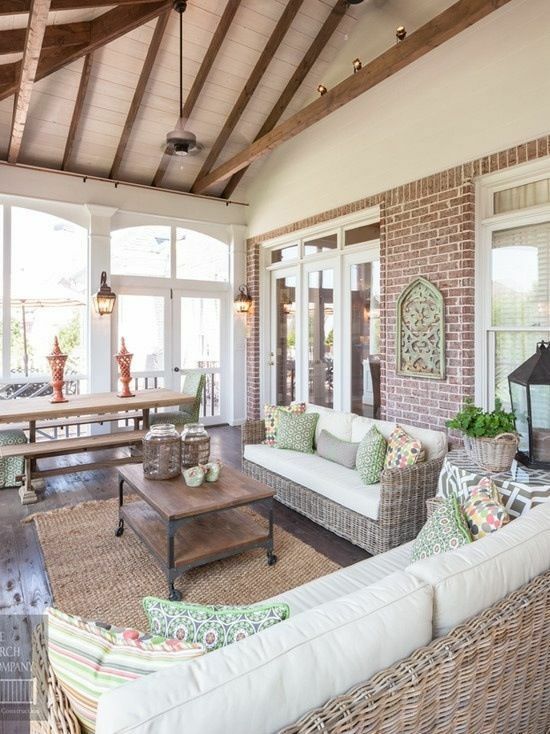 The traditional construction and decoration of this outdoor living room is so admirable. It has a quite spacious space with lots of ethnic, vintage, and traditional elements. 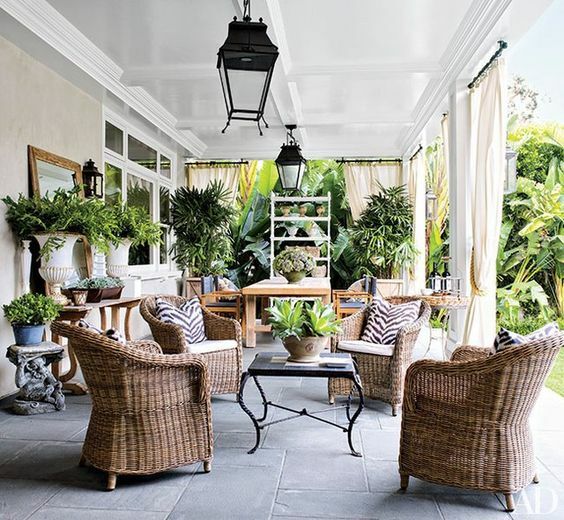 This kind of outdoor living room can handle lots of guests with its empty spaces around. Of course, the combination of its yellow and green walls is the main factor which makes this outdoor living room look so attractive. The furniture with raw natural material and catchy pattern emphasize the earthy theme of the room’s decoration. For sure, it’s an antique decoration on a budget that you can try. A living room set which consist of a sofa, table, and two chairs in natural wood finish is the main focal point in this outdoor living room. 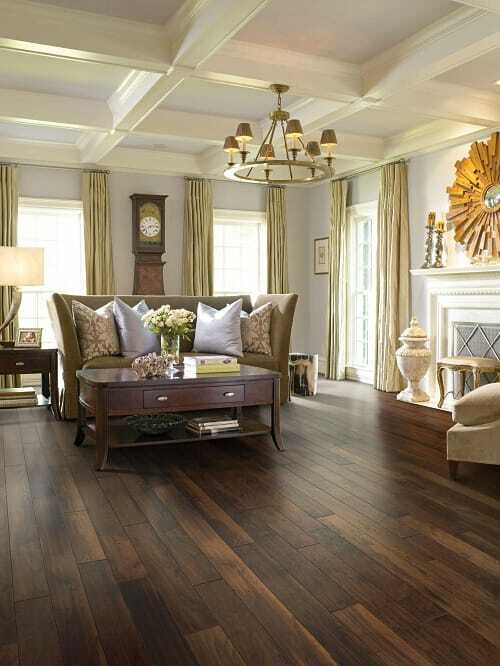 It complements the wood flooring in similar finish which creates a beautiful rustic decoration. The pergola roofs in white with its white drapes enhance the brightness of the room’s overall look. 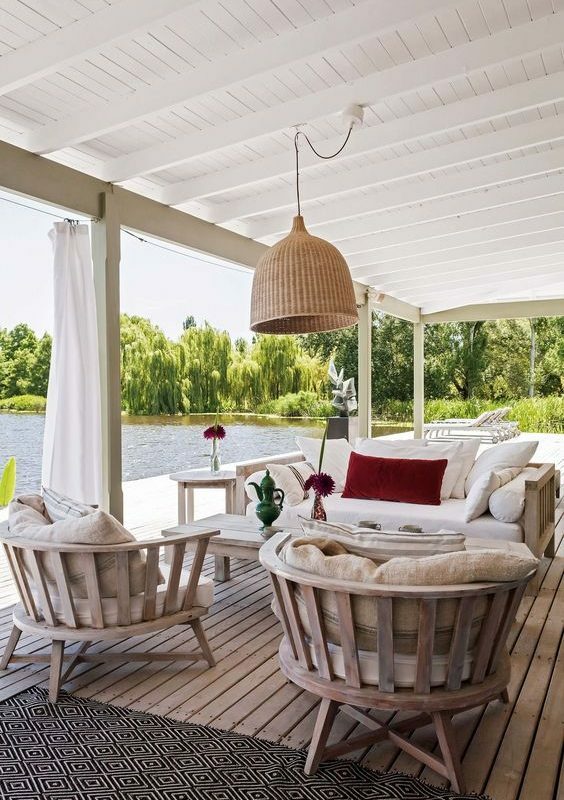 This outdoor living room looks and feels so inviting with its high-ceiling construction which makes it so airy. The room is surrounded by tall glass windows to maximally let the outdoor light comes through the room and create a spacious impression. 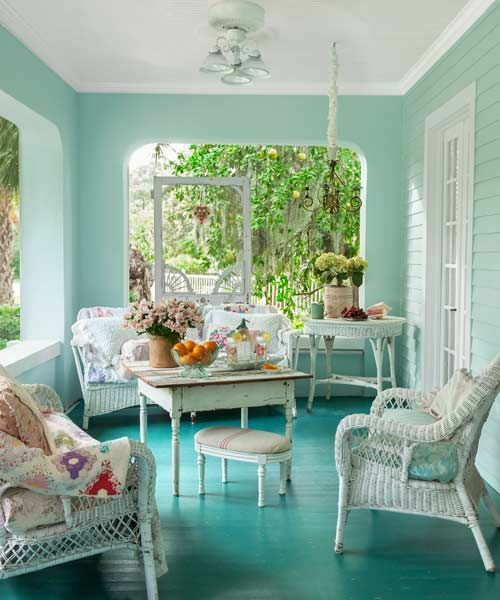 The country-style ceiling, rattan living room set and some touches of turquoise decorate the room gorgeously. A swing sofa in this outdoor living room makes it fee so exhilarating to enjoy. The swing bed offers a very joyful relaxing time which complete the living room set. The room also has a catchy color combination in which blue and green pop up perfectly among its white overall look. 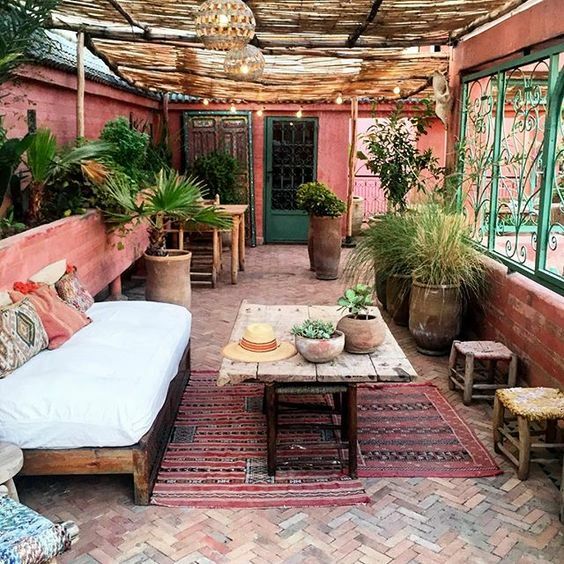 An exposed brick wall looks strikingly attractive in this outdoor living room which gives a nice rustic touch to its décor. The furniture in which is made of earthy materials in its natural finish enhance the rusticness of the room and their vintage design adds another style attractively. Shabby chic decorating style always works well for you who love the beauty of classic look. Here, a distressed accent table in vintage becomes the centerpiece of the room which complements the classic rattan sofa and chairs. 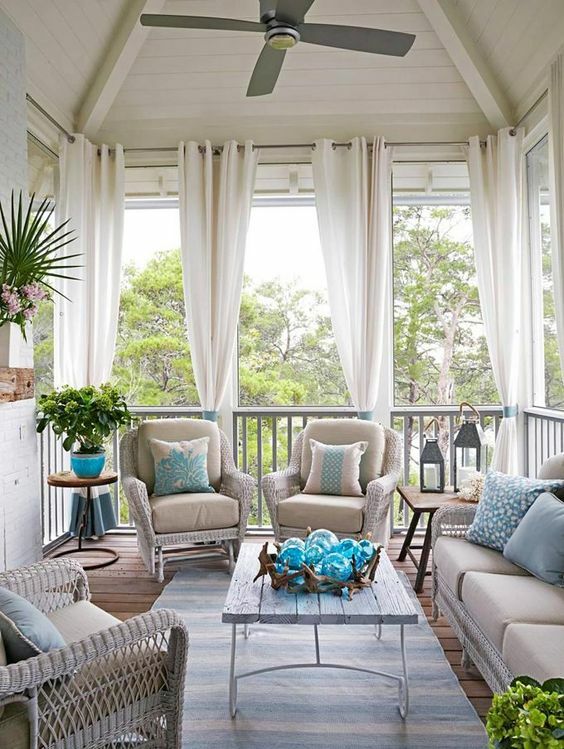 Turquoise is the main color of this outdoor living room which creates a brightly colorful overall look. It colorizes all sides of the wall and flooring while white ceiling and furniture balance the nuance beautifully. The decoration looks traditional due to its old-fashioned furniture set. 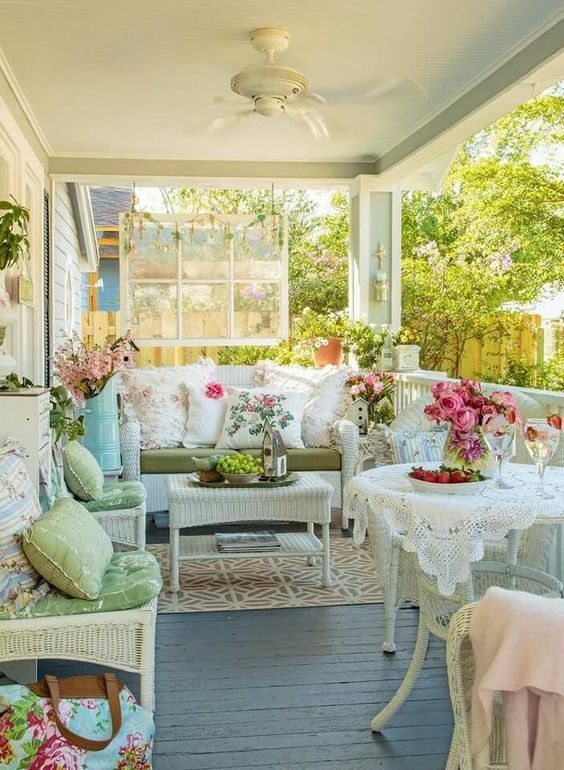 This outdoor living room looks so admirable with its whimsical decorating style. 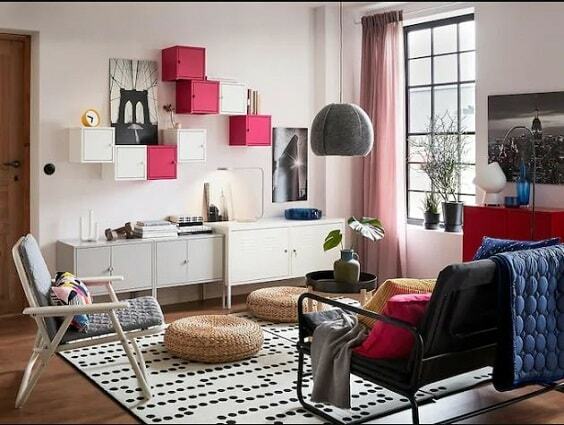 The rattan living room set, flowers, and DIY décor items style up the room in a very stylish way. For sure, it’s a good decorating inspiration for you who love classic theme. 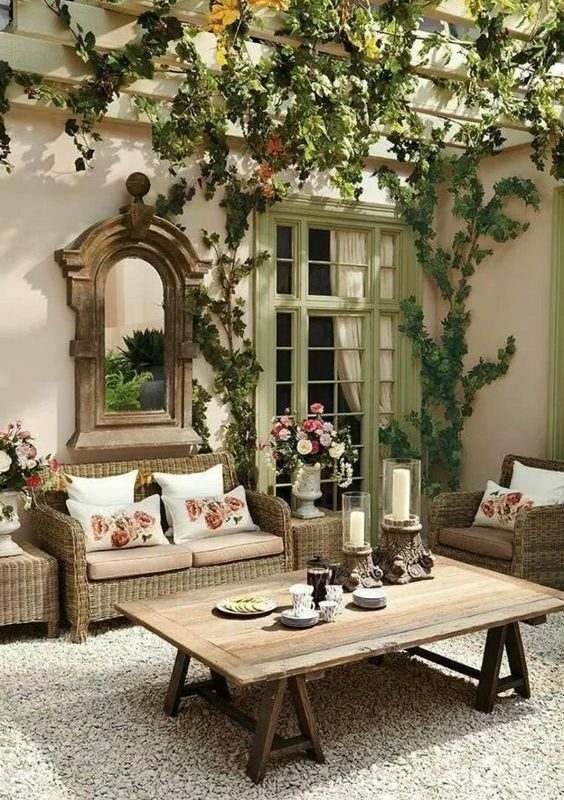 The combination of rattan conversation set as the focal point and lots of greeneries which dominate its decoration, this outdoor living room looks so elegant in a very natural way. It also has a brightly relaxing living room due to its white pergola and concrete flooring. A stylish outdoor living room which combines the vintage and modern style for its decoration. The walls are covered with grey brick wallpaper which gives a rustic yet modern look instantly. The furniture in classic design and rustic finish even makes the room look gorgeous in a more distinctive way. 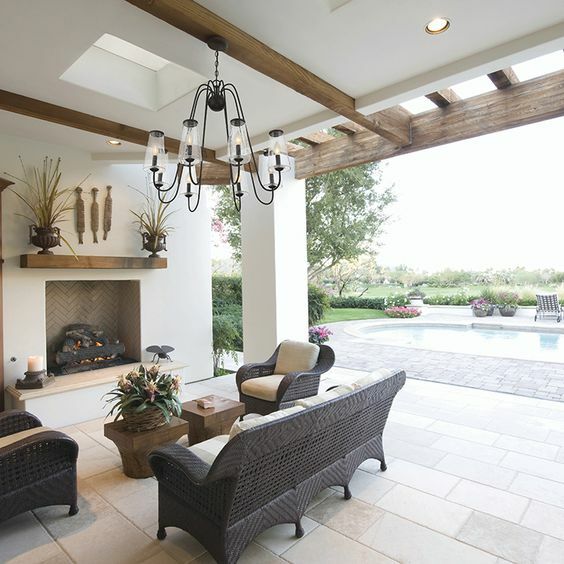 Here, the pergola works only as the accent of the décor which doesn’t shade the whole area of this outdoor living room. It gives a more attractive look especially with its string light. So those are some amazing outdoor living room ideas which will surely convince you to have one. 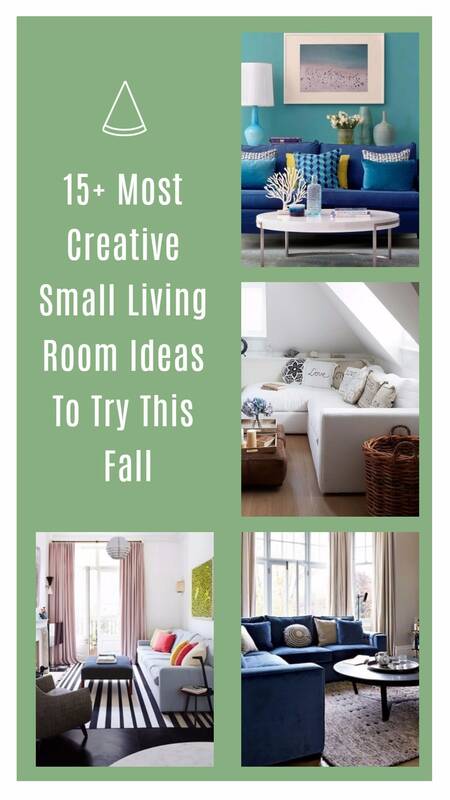 The way those ideas blend all the elements to like the color, furniture, decor items, and accessories are so tempting to steal. Pick the best idea which suits your needs, taste and the existing exterior of your house. 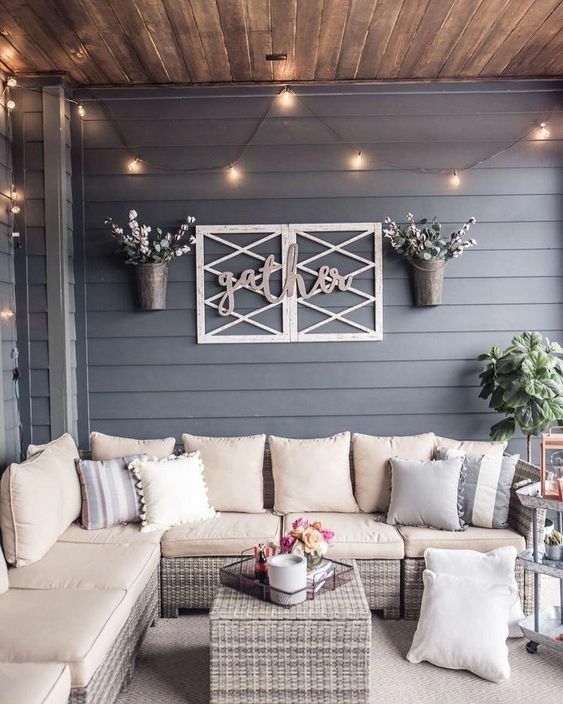 Keep in mind to incorporate the outdoor living room with the overall look of your outdoor living space, so you will have the one which looks and feels so inviting. Adding an outdoor living room to your house is absolutely a great idea which will enhance both its beauty and comfort at once. It will be a good spot for you to do some stuff with the relaxing outdoor atmosphere. Then, it will be a focal point of the exterior of your very own home sweet home. With those inspirations, you can have an outdoor living room without spending lots of money. 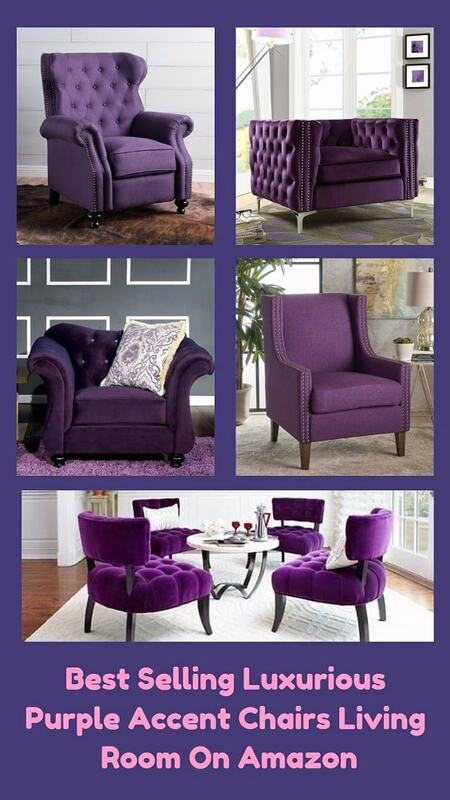 They use the repurposed material for the furniture, decor items, and accessories which surely saves your budget. 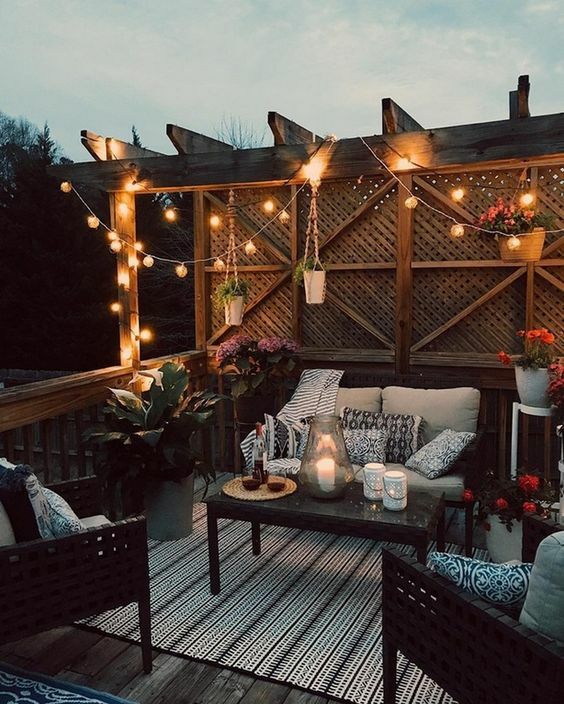 Then, the design of the room is also very simple yet gorgeous, because if you want a complicated outdoor living room, you may have to spend an extra budget. Well, happy building your outdoor living room now!